Lance Sergeant 200249 Frederick John Preston, 2/4th Battalion, Royal Berkshire Regiment. John (sometimes Jack) was born in Newbury on 19 September 1885 the son of Thomas Preston and his wife Annie (née Wright). He was the second of their five children, his siblings being: Flora (later Florence) Lavinia (born 1884), Thomas John (1886), Ernest Richard (1892) and Alfred William (1895). Thomas was a builder’s labourer at a time when Newbury w as expanding rapidly so he was likely to have had steady employment. The children were educated at St John’s Infant School in Newtown Road, the closest school to their home in St Mary’s Court, nine cottages in an alleyway between Cheap Street and Mayor’s Lane. It was so tucked away that their address is given in various records as Mayor’s Lane, Cheap Street and even New Market Street. They remained there until the late1890s when they moved to 5 Denmark Road for a few years before settling at 1 Arthur Road. Following their infant schooling the boys attended St Nicolas Boys’ School in Enborne Road; John was there from 15 March 1893 until 3 March 1897 when he left school to become an errand boy aged only eleven (by law children had to be at school until ten, which was raised to twelve in 1899). His results at St Nicolas suggest that he was bright enough, reaching Standard IV (the expected standard in reading, writing and arithmetic for a twelve-year-old) in 1996. This was not a spectacular achievement at St Nicolas’ which seems to have provided a good, if basic, education to its pupils – nevertheless it suggests that John had a bit above the average ability. 3 Enborne Place - 3 Rosemary Terrace, Enborne Road in John's day. It is not known where he was employed as an errand boy, but he eventually ended up working as a porter for Job Wells & Sons, a wine and spirit merchant’s business started by Job Wells in the Market Place. By the time John worked there the company had expanded from its original premises by purchasing the pub next door. This happened well before the Market Place was allocated street numbers so the combined premises have just the one number – 12 Market Place. Today the wine and spirit merchants is long gone and the premises are entirely used as a Weatherspoons pub, The Hatchet. In 1907 Flora (now Florence) was the first of the siblings to marry when she wed William New; John was the next, marrying Ada Brown in Newbury in 1910. However, between these two happy events there was family tragedy when their father, Thomas, died on 6 April 1909 aged only 43. More happy events followed: John and Ada had their first child, Leslie J W, in 1911 and a second, Frederick G in 1914. In 1912 John and Ada settled in 3 Rosemary Terrace, Enborne Road - though the address was deceptive as the house was part of a terrace of eight in a side road. 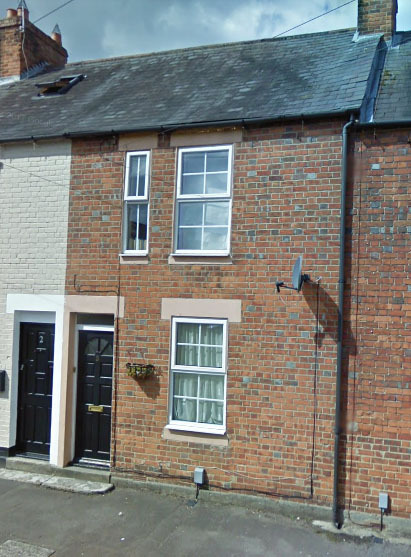 It is now 3 Enborne Place. John’s widowed mother, Annie, remarried to George Bellinger (her late sister's widower) in 1912 and his brother Thomas married Ada Mason in 1914. 1914 was, of course, the year that changed so many lives,; John had been serving with the local Territorials (the 4th Battalion, Royal Berkshire Regiment) in peacetime and was called up as soon as war was declared. As a Territorial he was committed to serve in a home defence role, anywhere in the UK, but could not be sent abroad. Desperate for men to serve in France the Army asked all its Territorial troops to volunteer for overseas service and to sign the Imperial Service Obligation (a form indicating their willingness to waive the home defence limitation in their terms of service). 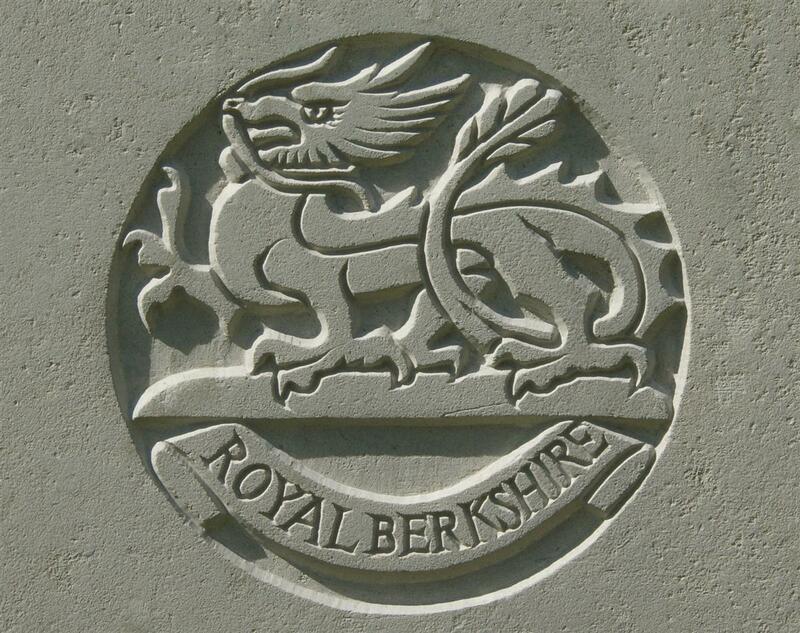 Around 70% of the Royal Berks Territorials did so and were separated into a battalion designated the 1st/4th Battalion. Those deciding not to sign, including John, formed the basis of the 2nd/4th Battalion . There is a tendency to view those who refused to volunteer as shirkers of some sort, but it is easy to see why a young man with a very young family to support would not want to rush of to war in a fit of patriotic adventurism. The 2nd/4th or 2/4th Battalion went to a training camp at Chelmsford, where they prepared for battle in case of invasion. As at school John showed himself to have ability beyond many of his peers and was promoted, to Corporal leading a section of around ten men and later to Lance-Sergeant (a field appointment allowing a Corporal to undertake the duties of a Sergeant) meaning that he could well have been second in command of a platoon of around 50 men, able and ready to take over should his officer be put out of action. In January 1916 the government passed the Military Service Act, which introduced conscription; it also changed the status of the stay-at-home Territorials – they were presented with a simple choice: sign the Imperial Service Obligation and go to war with the mates you’ve been training with for over a year, or be dismissed from the service and be conscripted to serve wherever the Army sees fit. Unsurprisingly most opted to stay with their mates and the 2/4th Battalion was soon sent to Salisbury Plain to make the final preparations to cross the Channel as part of the 184th Brigade, 61st (2nd South Midland) Division. On 27 May 1916 the battalion landed in France at Le Havre. This was less than five weeks before the Battle of the Somme would start on 1 July – newcomers like the 61st Division could not be ready so quickly, so they were sent to relieve a more experienced division in the line to the north of the Somme battlefield. However, it was not long before they were involved in a major action. 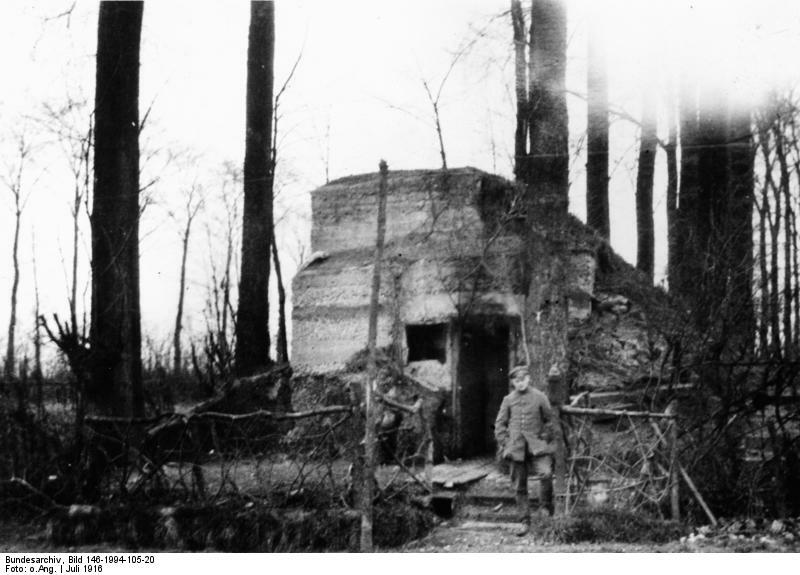 A German strongpoint at Fromelles. To the south the British (and Empire) 4th Army was locked in the struggle on the Somme; 1st Army to the north was tasked with launching an attack on 14 July aimed at distracting the Germans from a major 4th Army attack on the Bazentin Ridge. Within 1st Army, XI Corps (62st Division and 5th Australian Division) was given the job. It was decided to attack near the village of Fromelles, but it was not possible to attack on the 14 July as planned, a few days delay ensued, by which time the Battle of Bazentin had been fought and there was no strategic reason to press on with the assault. Nevertheless the corps commander, Lt-Gen Richard Haking, decided that his raw troops needed the experience and that the inevitable casualties would be worth the long term benefit to the untested men. The result was what has been described as the worst day in Austalian history – the attack took place on 19 July and the overenthusiastic Australians rushed ahead, leaving their flanks exposed allowing counter-attacking Germans to cut off most of them from their own lines. Losses were colossal. The 184th Brigade was tasked with overcoming a German strongpoint known as the Sugarloaf – a daunting task for battle hardened troops, but probably beyond comprehension to men whose first experience of the front line was less than a week earlier. Unsurprisingly it all went horribly wrong. To this day General Haking is referred to in Australia as Butcher Haking. Mrs Preston, 3, Rosemary-terrace, Enborne-road, has received news that her husband, Corpl John Preston, of the 2/4th Royal Berks Regiment, is in Norwich Hospital wounded during the recent fighting in France. Fortunately the wounds are not of a serious character. Mrs G Bellinger, Arthur-road, the mother of Corpl Preston, has two other sons serving in France. Lance-Corpl Tom Preston, after serving eight years in India, went to France with his regiment, 2nd Royal Berks, in November, 1914, and with the exception of a few days has been on active service during the whole period. The other brother, Lance-Corpl Alfred Preston, is in the Motor Transport, ASC, and has served over a year in France. A daughter of Mrs Bellinger (Mrs New, Belvedere-terrace, Queen’s-road) is the wife of Pte W New, of the 5th Royal Irish Lancers, now in Ireland at the regimental depot. He has served in France and has been wounded. The brothers Preston are cousins to the two brothers Bellinger who have both given their lives for their country. PRESTON – June 7, at the 47th General Hospital, Le Treport, France, of wounds received in action on June 4th, Sergt F J Preston (Jack), the dearly loved husband of Ada Preston, 3, Rosemary-terrace, Enborne-road, and the beloved eldest son of Annie Bellinger, 1, Arthur-road, aged 38. – His end was peace. To-day’s obituary column tells of the death of Sergt F J Preston, which took place on June 7th, an the General Hospital of Le Treport, France, of wounds received on June 4th, leaving a widow living and 3, Rosemary-terrace, and two fatherless boys. Deceased rejoined the Territorials (2/4th Royal Berks Regiment) in 1913, and was called up at the beginning of the war. After training at Chelmsford he went out with his regiment to France in May, 1916, where he received a gunshot wound in the thigh on July 16, 1916. In December last he was home again for his final leave, returning to France on 19th of that month. As before stated, he was again wounded and taken to the hospital at Treport. Here he wrote a letter to his wife, in which he spoke of coming h0me, but the letter was unfinished, unconsciousness setting in. The letter was, however, sent on by the Matron, who explained that death followed an operation, and that during the last few hours he was under her care he showed himself kind and thoughtful to a degree. Two telegrams had been received from the War Office, the first saying he was dangerously ill, the second telling of his death. Deceased has two other brothers in the service of their country, one in France, the other at Grantham. He will be remembered as having formerly been in the service of Messrs Job Wells and Son of the Market-place. Enemy’s artillery were particularly active during the morning on the front and support lines & also in the vicinity of Bn HQ near La Fosses Farm. The shelling of the latter was kept up from 7am till 1pm. Between 500 & 600 shells, consisting of 5.9ins & 8ins, were fired during this period. The same wiring party under 2nd Lt G L Warlock continued the wiring of the Support Line on the same lines as the previous night. Patrols were sent out with the object of ascertaining enemy’s dispositions, and succeeded in locating the approximate positions of two of the enemy groups. Snipers posts were pushed out as usual. 2 OR wounded. The odds are that he was injured during the four hour bombardment of the battalion’s positions – which, otherwise, seems to have had remarkably little impact. Evacuated down the medical chain to the 47th General Hospital at Le Treport he would have received the best available care – which evidently was not enough to save him. John's name on Newbury War Memorial. Locally he is remembered on Tablet 4 of the Newbury Town War Memorial, the parish memorial board and roll of honour in St Nicolas’ Church and on the splendid memorial to the fallen members of the Newbury Congregational Church (now located in Newbury Town Hall). In loving memory of my dear son, Sergt John Preston, who died in Le Treport Hospital, France, of wounds received in action June 7th, 1917. To kiss his face or wish him goodbye. Whom we lost one year ago. From his loving Mother, Sister, and Brothers. PRESTON. – In ever loving memory of my dear husband, Seergt Frederick John Preston, 2/4th Royal Berks Regt, who died of wounds in France, June 7th, 1917. – A devoted husband and father. Yet still to memory dear. From his Wife and two little sons. As mentioned in the newspaper report from 1916 (above) John had two cousins John and William Bellinger who perished in the war - indeed they were more than simply cousins, following his mother's remarriage they also became his step-brothers. 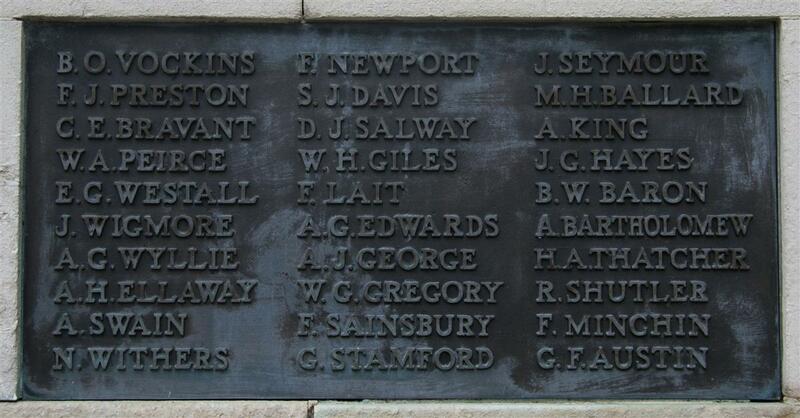 They too are named on the Newbury memorial.